Here's a hearty vegetable soup that makes great use of the bounty that is a winter CSA box in the upper Midwest. Matt put together this tasty concoction of carrots, celeriac, parsnips & cabbage to have as our lunch last week. All the vegetables together with the seasonings made it flavorful enough that it didn't need to even be made with stock. 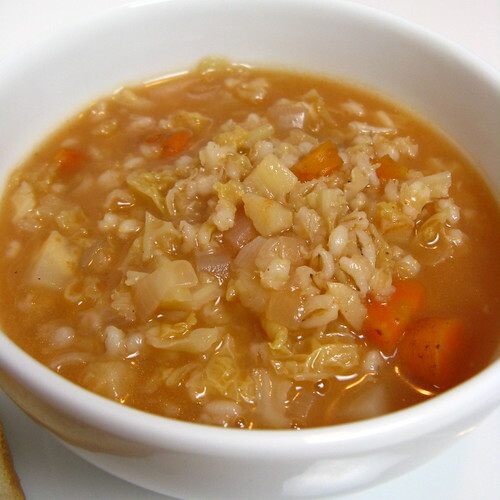 The barley adds body & texture to this filling & very healthy soup. In a large soup pot heat the olive oil over medium-high heat. Add the onion & cook until tender about 3 minutes. Add the carrots, celeriac and parsnip then cook another 3 minutes. Add all remaining ingredients. Bring to a boil. Reduce heat, cover & simmer for 60 minutes. Taste for seasoning & add salt & pepper if needed. Sounds like a delicious healthy meal to help me detox from all the junk I ate yesterday! I love barley in soups...we need to eat more barley. Hey Kat- I know you are probably away or visiting with family but in case you read this. I would like to know where you found that hole punch. I so could use it. This looks great! Comforting yet lighter for a post holiday meal. :) Hope your celebrations were merry! boy, barley is totally underrated and underused. this is a fantastic, body-warming soup, kat. enough with the heavy, rich stuff! We tried this recipe last night and it was wonderful! Just perfect for a cold winter night!